Thank you so much for visiting, and your continued support, even in my absence! I have taken on a career that requires a lot of work, and a lot of time, so I am still unable to return to the scene, and mix something up... I do, from time to time, check in to see what you all are doing, and I miss being part of your world actively. Hope to return soon, at least on a monthly basis, till then, please enjoy Cafe Chocolada! I have recently made this awesome light as air Tiramisu, based on a recipe from Masatera of “Recepti iz moje biljeznice” (Recipes from my notebook), and just slightly edited to what I had available here. It is not based on a traditionally used mascarpone cheese, but rather I have used Philadelphia whipped cream cheese, and got this luscious cream, which make you feel like you are eating sweet delicious air! Mix whipped cream, with powdered sugar, and whipped cream stabilizer until whipped, then add cream cheese, vanilla extract, and mix well. You may also add like 1 or 2 drops of yellow food color, but that is completely optional. I'm so sorry that you're going through such trying times right now. My thoughts are with you during this tough period. 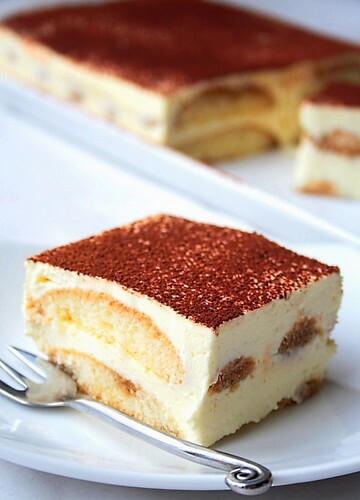 I must say that this tiramisu looks fabulous! Hopefully it added a bit of cheer to your days. Looking forward to your return once life is a bit more settled! Odmah sam snimila poznatu sličicu na tvom blogu :). Predivno si ga napravila a tek slika!! Počašćena sam, tvoja slika je moju stavila u sjenu, morat ću ga ponovo radit samo zbog slikanja :) Pusa! Sorry to hear about the tough times you are going through. I wish you well and hope that everything works out. And on your tiramisu....YUM! I love tiramisu but have yet to try it at home. Your recipe just might inspire me. It sounds like a horribly frustrating and stressful situation, I hope things get settled fairyly. The tiramisu looks beautifully light! Oh I am so sorry to hear of your problem! You fight em good and WIN! This Tiramisu is AMAZING! I saw its picture and I'm just fascinated by it now. You've a great blog and recipes. I'm also sorry for all those bothersome issues you have to deal with. I hope you overcome it soon. Thank you ladies - Tiramisu is indeed delightful! I'm a strong woman, I know I'll come out victoriously, and I am doing my best to stay calm and collected! I'm very sorry to hear about the troubles you are having to go through. I'm afraid there are so many others going through the same thing as you. I wish only the best for you and keep up the fight! Oh goodness, how terrible! And yet you left us all such a beautiful gift to look at. Best of luck, my friend, sounds like you're at least on the good side and it will all work out. And maybe for no other reason than I don't want to wait too long for more recipes!! stvarno mi je žao što prolaiš kroz sve ovo...mislim na tebe i nadam se da će se sve završiti dobro! Joj Melitta pa ova priča je strašna. Svaka ti čast na snazi i upornosti i nadam se da će sve ispast dobro za tebe. I još ti želim reći (ovo ne moraš objavljivat ovo je više privatni komentar) da ti se posebno divim na snazi jer mogu samo zamisliti što znači biti sam u dalekoji stranoj zemlji. Kako je prilagodba na novu kulturu i jezik bila teška i onda još i takav ružan događaj. Vjerujem da ćeš ti izaći kao pobjednica iz ovoga, uzdignute glave. Imaš moju punu moralnu podršku. Samo tako naprijed! I'm so sorry this is happening to you :( Be strong, I know you'll win! Thank you all for wonderful comments and support! I'll be fine, especially once the lawyer takes over, so they can't harass me any more, and I'll let you know what is the outcome. It may take years before I see the results, but it might not, I am sure proper authorities will see this case as high priority so those people would be stopped. Anyway, don't you worry about me, all of this has changed me, given me more wisdom, and I am confident all the harm they did will have to be fixed. I certainly hope they will be brought to justice soon! Oh I am really sorry to hear about you difficulties, hope everything work our for you. Oh Medena, I hope things get better soon but this cake my word, it's beautiful. Melita, I am sorry to hear about your problems:( but I am sure you will win and justice with prevail! How sweet of you to post another delicious recipe amidst this stressful time. Looks so delicious!!!! I just wanted to tell you how much I've enjoyed your blog. I found it through Foodgawker, and it is absolutely breathtaking. You have a real talent for photography, not to mention cooking. Thank you for sharing such beautiful work! Best of luck through this difficult time. Thank you Emily, and everyone else! I'm very sorry to hear about your troubles. I hope verythng works out for you. awww sounds awful! What goes around, comes around and I believe in Karma! Great foodie blog! Draga Melitta...zelim ti da iz svega izadjes kao pobjednik, pa makar i nakon nekoliko godina bitke. Drzim ti fige!!! Ne znam tacno o kakvoj se prevari radi (osim da su u pitanju nekretnine i falsificirani podaci), ali znam da prije svega boli prevara, a tek onda financijski gubitak. Jbg. takav je zivot, ono sto te ne ubije cini te jacom, a i ne kaze se dzaba - oteto prokleto. I am very sorry to hear what you are going through. I hope it works out well for you. Really hope everything can be solved in a short period. Delicious recipe and wonderful picture. I'm so sorry to read that you are having such an awful time of it. Hope is gets sorted soon. PS. the tiramisu looks delicious! So sorry to hear about this! Good will prevail in the end. I really enjoy your posts and yummy photos. Take care. I made this tiramisu with some friends, and literally cried with joy after I tried it. Thanks for the great recipe! I can now enjoy my favorite dessert without the danger of raw egg! That is completely horrible news. I wish you nothing but the best and hope that everything gets resolved very soon for you. evo i mene k tebi, predivan je blog, a ovaj tiramisu je neodoljiv, prekrasne slike! I just found your blog - so sorry to hear about such an awful thing. I hope it gets resolved quickly and correctly. Look forward to your return and will explore your blog in the meantime. Žao mi je pošto si morala da pređeš preko takih stvari, te molim da dođeš do mene gde imaš neke premije koje te cekaju. Verujem da ce da te razveseli. I am so sorry to hear about this awful situation. My heart goes out to you...I hope you can get it resolved. I am not a big fan of Tiramisu in that States, it tastes totally different - much boozier, mushier & all together not my fav. I find your recipes and photos very interesting and beautiful! I hand you this [url=www-vicktory.wordpress.com]Inspiration Award! [/url],which I have received shortly myself. Hi, Mellita! Your blog is so, so amazing! I really liked it! I add you on my favorite blogs, I hope you don't mind! ...hope it comes to an end soon! I wanted to invite you to my blog, where a special gift awaits you, an award called: Blogger Oscar, for your precious culinary creations!!! Oh my goodness I am so sorry to hear about what you are going through with your mortgage. We are in the process of buying a home right now and it is definitely scary to think how easily others can take advantage of honest people. Keep fighting!! Your tiramisu looks beyond amazing!! Hey Medena, I have been away for long for personal reasons...saw this post only today...thats sad...I hope those miscreants get their due. Will pray for u. Thank you so much for posting the recipe. I hope everything go well for you. what a treat .....so nice! i'm sorry to hear what happened to you, i hope it'll resolve any time soon. I can't imagine how frustrating an painful your experience is. Be strong and smile a lot. This too will pass. Someday, you will have some great stories to tell. I don't know if that helps but I am trying. WOW! I found your site and I truly enjoy it! You have wonderful posts. I hope that you will get through your hard times...I am looking foward to more posts. That definitely looks like one of the lightest tiramisus that I've ever seen. Great pics. Melita I've missed you! I'm so glad you checked in and let us know you're still out there, even if you're too busy right now to post your fabulous creations. I hope you are enjoying the new career that is keeping you so busy. Come back when you can! speechless for all of yours recipes!! Congratulations!